I’m sure you’re with me when I say that the feeling of soft and almost ‘cuddly’ clothes or bed sheets is heavenly, especially when also infused with a delicious smell that makes you want to stay in bed all day. But how do you get that magical effect? I’ve read numerous articles online discussing how to get the holy grail of softness and scent, alongside ‘cries for help’ on how to rectify crisp and rough washing disasters. So I’d like to hear from you. 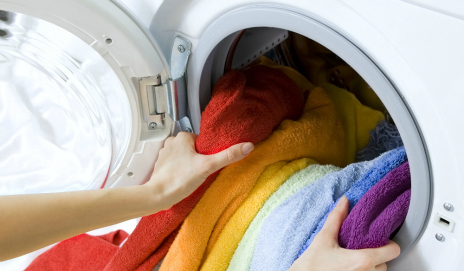 How do you get your clothes, towels or bed linen soft and smelling delicious? How do you bring life back to coarse fabric? When we asked people about some of the techniques used, 11% said they opt for dryer sheets and 12% use dryer balls. Have you tried them and found they help? Most people said they hang their washing outside to give it that fresh smell and feel, but there are a fair few that use the tumble dryer instead. Maybe you use a combination of both? So what about the smell? It’s harder to replicate the smell of something like Spring Awakening or Ocean Breeze at home. What have you done to try? And from that huge array of scents and colours of fabric softeners in the supermarket, what draws you to discover what fragrance is hidden inside and then to buy? For me it’s fresh linen and a clean, white bottle. But I don’t put fabric conditioner in with everything – I like to use the washing line and let the power of fresh air blow through my towels. I also know from the comments made here on Which? Convo that some of you don’t like using fabric conditioners at all. So, fabric softener or no fabric softener? How do you get your clothes, towels and bed linen soft and smelling gorgeous? We are waiting for a full which test of this products please. I wash my clothes and sheets either with eco balls or with a detergent such as Persil Small & Mighty or with Aldi detergent (convenience & need to give a colour boost drives choice). When using detergent I tend to keep the dose low and see what happens. Mostly a low dose does the job fine. Wherever possible I dry my washing out on the line. Smells just wonderful. No fabric conditioner necessary at all. I give my towels a v short (eg 15-20 low temp spin just to fluff them up if necessary). I’m not wedded to any particular process (& hate washing ‘badgering’ whether from advertising or other bandwagons) beyond reducing detergent and energy where reasonably possible and using the sunshine and fresh air as much as possible to dry & revive washing and give it all a lovely smell. Don’t forget hay fever and high pollen count. Drying your washing outside when the count is high is not recommended for hay fever sufferers. I always use 2 tbsp white vinegar when washing towels, facecloth or cleaning cloths. For almost everything else I use about half the minimum recommended dose of fabric softener. My belief is that manufacturers’ recommendations are set high (to sell more!) and using less works just as well and doesn’t gum up the washing machine’s insides (or the fabrics). Being vegetarian I don’t use Fabric Conditioner unless it’s tallow free. I also don’t find it necessary and as it’s not rinsed off the fabric rather not use it. Hello “Hoovermatic ” yes I had one , remember the plastic slotted edge “key ” you plugged in to change programmes ? I take it you refuse to accept the new £5 “plastic” notes because they contain animal fat ? Morrissey is against them as is the Rainbow Cafe and Hindu,s ? Since manufacturers are not obliged to mention non-hazardous ingredients of their products it would be difficult to know if fabric conditioners contained tallow. As you say, they remain on the fabric and I’ve never used them. Duncan – Are you referring to the Hoover Keymatic? Hoovermatics are twin-tubs and I’ve not heard of one with a key. Your right Wavechange but I also had a steel/aluminium Hoover twin-tub previously , one of my aunts ran a Hoover spares shop and I got spares cheap. Not very big spin section on the old twin tub but they lasted a while just belt changes. I remember because my mother had a Hoovermatic for many years. The blue anodised aluminium cover on the spin drier looked very modern. That was in the happy days before anyone tried to convince us we needed fabric conditioner.